Sport can be a cruel mistress at times. One minute you are being recognised by higher powers for being in the form of your life, the next you come back down to earth with a season-ending injury. Unfortunately for Peterborough United midfielder Jermaine Anderson, that is exactly what has happened to him. The 19-year-old was named Football League Young Player of the Month for November, a month in which he scored four goals in four games. But just three minutes into the FA Cup visit of Luton on 6 December, he suffered a knee injury which will keep him out for the rest of the campaign. Anderson told BBC Sport: "It's difficult, but it's football. Football loves to spring surprises on you and it's just how you deal with it which sums you up. "It's a shame for it to happen but I'll be working hard with the physio, doing my rehab and hopefully coming back better, fitter, stronger and I'll see if I can improve on other areas of the pitch." 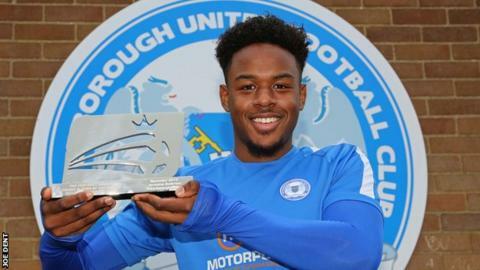 Peterborough United have become the first club to have three winners of the Football League Young Player of the Month award - Anderson, Britt Assombalonga and Marcus Maddison. It is not the first time in his short career that the London-born midfielder has had a long-term lay-off, having missed the end of last season after breaking his foot. But, almost certainly speaking from experience, Anderson is philosophical about his road to recovery. "It's not an injury you can't come back from, loads of people come back from it all the time," he said. "It's just whether or not I want to put in the work or not, which obviously I will do to get back to how I was playing. "I think with the people that I have around me, the physios and the management staff, they won't allow me not to come back to how I used to be. It won't be easy, but I will come back to how I was." Before his injury, Anderson was a key member of Posh's midfield diamond, a system that has given the Cambridgeshire club new life since manager Graham Westley took over at the ABAX Stadium in September. Under the former Stevenage boss, Posh have climbed from 18th in League One to a play-off place, with Anderson's goalscoring run more than the rest of his career combined. "The gaffer telling me I need to score more goals and affect the game going forward," replied Anderson. "In training I was working on late runs into the box, doing more work on finishing in and outside the box and knowing when to go for headers and crosses because our full-backs get up high and get good balls into the box. "I think he's made me a more attacking player because I was doing well defensively but I wasn't getting many assists or goals. That's something him and Grant McCann noticed straight away - to make me an all-round midfielder." His form sees him follow in the footsteps of his close friend, Tottenham and England midfielder Dele Alli, who won the award in August 2014. The pair know each other from international youth teams and playing against one another in development squads. Asked if they would speak about his award, Anderson joked: "If he can take time out of his busy schedule to have a word with me, then yes." He continued: "It's nice to win an award that a lot of great footballers have won in the past, Wilfried Zaha and other players like that, so it's an honour for me to be in the same sort of bracket." Anderson comes across as a man who has matured through his experiences in football, having been let go by boyhood club Arsenal at the age of 16. "It was horrible at the time, because I was still quite young and being an Arsenal fan it was gutting at the time," he said. "My mum was like 'well, everything happens for a reason, one door shuts, another one opens' and it did at Peterborough." He would not go too far wrong to trust his mum's advice yet again as he looks to bounce back from a little bit more adversity.